Robert E. Smith Field was a bit dirty this weekend so the Panthers decided to get the brooms out and sweep conference rival, Spalding, to clinch the number one seed in the east division of the SLIAC. 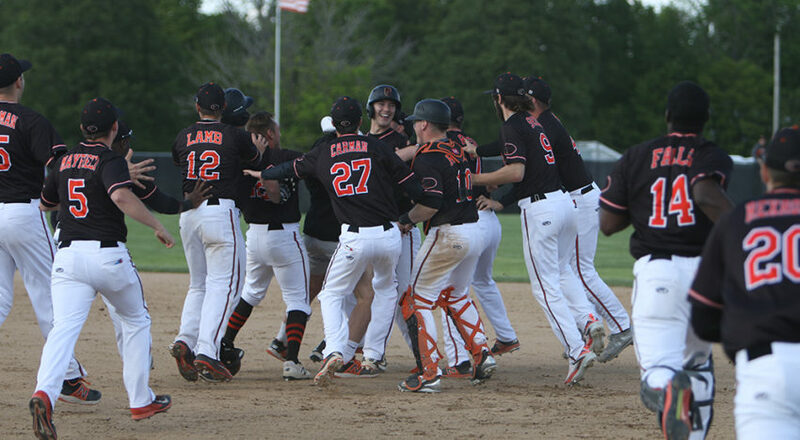 Spalding came into town to play a three game series against the Panthers that consisted of a nine inning game on Friday and a doubleheader on Saturday. The Golden Eagles had their eyes set on an easy weekend to cruise to the one seed on the east, but the Panthers had other plans. Game one was set to be a good one as Jonah Moore went to the mound to face Spalding ace Jimi Keating. 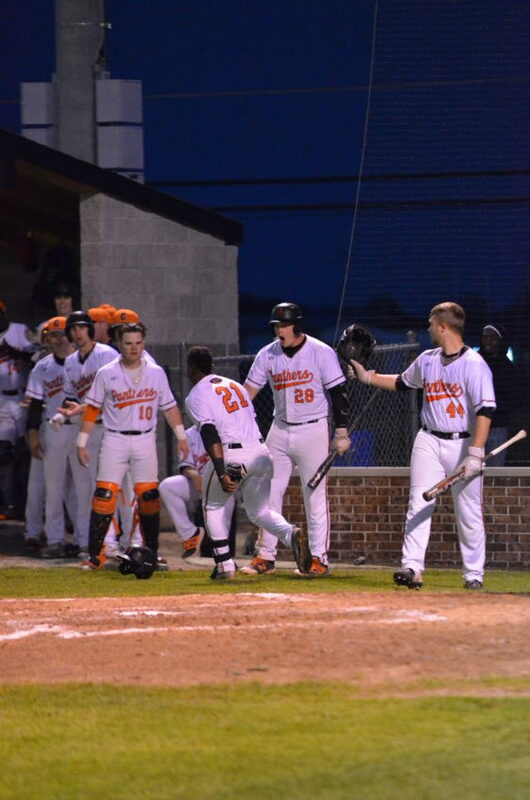 Spalding led off the game with a double and the runner eventually scored after a couple groundouts. The Panthers were kept quiet by the undefeated Keating until the fourth inning when they scored two runs on four hits to take a 2-1 lead. Spalding tied it up in the sixth but it was short lived as Mike Hardin sent a line shot over the left field wall to end the game in a 3-2 victory. The Panthers handed Keating his first loss on the season as Moore ended the regular season at 8-1. Game two featured Phil Reedy on the mound, making his last career regular season start, against Kyle Olliges of Spalding. Greenville got the scoring started in the bottom of the first earning two runs on three hits and one error by the Golden Eagles. A few quick innings passed and then Spalding tied it up in the fourth after two hits and a Panther error making the score 2-2. Travis Ralls earned an RBI in the fifth to make the score 3-2 and it stayed that way for the rest of the game to give the Panthers another 3-2 victory over Spalding. Reedy ended the season with a record of 3-1 on the mound. Game three was going to be a battle as the Panthers needed the sweep and Spalding did not want to let that happen. The Panthers sent lefty Adam Lamb to the Mound to face Cole Slamko. The game stayed quiet until the third inning when Max Gabriel drove in Bryce Pearce to take a 1-0 lead. In the fifth, a leadoff single by Caleb Miles eventually led to an RBI by Jesse Getz through the right side to take a 2-0 lead. Spalding finally notched one in the runs column on a wild pitch in the top of the sixth. Greenville took a 3-1 lead in the seventh and then Spalding scored on an error in the eighth to make it 3-2. In the ninth for Spalding, a base hit scored one but Austin Marsh and Danny Strohm did a great job at getting the ball in to stop another run from scoring as he was tagged out at home. The Panthers capped off the weekend with a walk off single by freshman Chandler Dix to win the game 4-3 and complete the sweep! 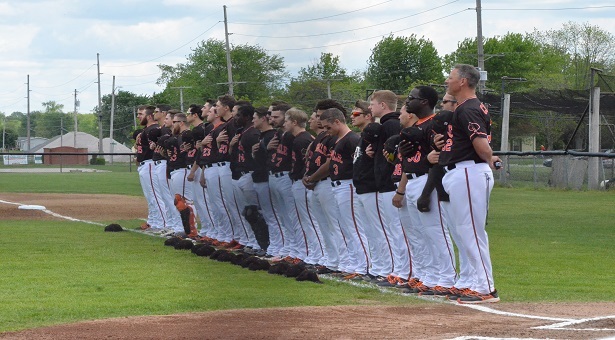 Along with the exciting games fans were able to watch this weekend, for those that came on Saturday were able to watch the Senior Day Ceremony in between games. During the ceremony, Coach Carlson honored the seven seniors: Mike Hardin, Max Gabriel, Tristan Wesselman, Shane Olmsted, Caleb Miles, Phil Reedy, Devin Mayfield, and their families. For those of that were not able to make it out, below is a video of the ceremony. With the sweep, the Panthers take over first place in the east and finish the season at 26-14. Greenville hosts the SLIAC tournament starting on Thursday, May 11th. As the one seed on the east, Greenville will take on the two seed of the west, Westminster. That game begins at two o’clock on Thursday followed by a matchup between Spalding and Webster. Be sure to follow the Panthers on Twitter and check out the website for stats and schedules. For information on the conference tournament make sure to check out the SLIAC website. Go Panthers!